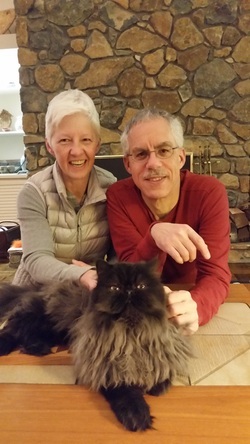 8 Month Old Noah, an Extreme Black CPC Persian, with his new family Mike and Carolyn. Noah was my cry baby of the litter until he grew up on a camping trip and started eating dry food. I really love camping trips. Those trips help mature my kittens and get them ready for their new home. Once Noah was finally on dry food, he put on a ton of weight. He was a very spoiled kitten at the Cattery. He loved the "bug". He loved to play, loved to kiss, loved to be loved. He had the lowest nose pad of the litter. On July 27, 2014, our Noah went to his new home with Carolyn and Mike. He has a playmate at his new home. Miss Cleopatra, nicknamed Cleo, is a 3 year old Shaded Golden Persian. In May 2014, Carolyn lost her precious Latte, a Seal Point Himalayan male to PKD. Carolyn has always had two cats in her home. Turns out that Noah has become an avid nurser on Carolyn. She is working on breaking him of this habit. He totally sees her as his new mommy. Here are the pictures and comments that Carolyn has sent via email or posts to Facebook. July 27, 2014, via email: "Hey Susan, We arrived home safely and have just finished playing with Noah. When we left your house, Noah cried for few minutes and then fell asleep and slept all the way home. We left him in the carrier for a few minutes when we got home so that Cleo could have a sniff. Rather than being confrontational, she seemed quite fearful - maybe too many strange cat smells?? Anyway, I then set Noah up in his bathroom. He had a few sip of water and then climbed in his bed for another nap. " Oh my, it was a very tiring day", he said. We then went off to the kitchen for dinner. After dinner, we went to check up on him - with toys & camera in hand. I think we woke him up but he was happy to see his toys, especially the Boink and the spring. He then proceeded to eat and eat and eat. Then he played and played. We just left him to take a rest. I think we need one, too! It was so nice to meet you and all the other kitties. We are crazy about Noah. He is the perfect kitty for us. P.S. Mike likes him a lot." July 31, 2014, via email: "Hi Susan, he is doing great today - eats like a little piggy! Wow! He wants to climb in my lap, wants to be rubbed. He slept great overnight - me, too!Cleo does not like him at all. She seems appalled, like what did you do!! When I bring him out to introduce them - she runs upstairs. She is feeling very insecure. I guess this will take some time. Too bad, because he is ready to explore rest of house.Will keep you posted." August 1, 2014, via email: "Hi Susan, Photos are wonderful. I downloaded them onto my IPad so I can show friends my beautiful new kitty! He is doing great! I have expanded his space to include the sewing room and he is very happy exploring and playing. Both Mike & I go in to spend quality time with him. He doesn't seem to be lonely - he is eating lots and yesterday made a great BIG poop. His food arrived yesterday and I gave him the Little Bites although he seems to prefer the bigger stuff. I think I will just mix the two and hope that he eats the little bites also - just so it doesn't go to waste.Cleo is still really stressed but I decided to just relax and wait for things to happen. Maybe I will bring one of Noah's blankets into her space, so that she starts to get used to his smell.He is such a darling - cuddly and playful - and very happy!" August 2, 2014, via email: "Yes, I did get Cleo as a kitten (a young kitten) but I guess you have to consider that Latte was pretty old (11 yrs) when she came and set in his ways. He was not interested in playing so maybe she doesn't know how to play with another kitten. However - good news. She is getting curious and hanging outside the door of the sewing room. She actually came in as I was leaving yesterday and came over to smell him. Not a standoff - she calmly left afterwards. So, I think we are making progress. Still taking it slowly." August 4, 2014, via email: "Noah is doing very well. He is growing like a weed. I swear that he is visibly bigger everyday and getting so much more adventurous. I had dinner guests this weekend and he just marched around like he owned the house. Cleo was upstairs. She has become very territorial about the bed - our bed! However, she and Noah have interacted for brief periods. The first time I brought him out to play, she just followed him around - at a distance of about 3 feet. She seems curious about him - doesn't seem able to figure out 'what he is and why he is in her house'. I am introducing them in 15 minute periods. Then I take Noah back to his room where we play and cuddle. He has lots of toys (I got him a tunnel and 2 cubbies) and he loves his kitty condo. At first, he could not get up on the top shelf, so we moved it near the sofa. Now he climbs right up and spends his time at the top. He is eating well, using his litter box and doing very cute kitten things! Michael adores him." August 6, 2014, via email: "Hi Susan, It is so nice to read about Moses and his new family (Orchid, too!). It sounds like both will be much loved. I must tell you that I really laughed to hear about Moses - or should I say Tumnus(?) - racing around the house. Clearly, he and Noah are brothers!! We have finally liberated Noah from the sewing room - at least when we are home. He does exactly the same thing as Tumnus - tearing around the house, jumping over furniture, up & down stairs. He has poor Cleo completely terrorized. Not only does he chase her, he eats her food, uses her litter box and even sits in HER kitty house. Then when he completely wears himself out, he comes over to me, cries and waits to be picked up. We still put him in the sewing room when we leave the house and for the night. He doesn't seem to mind - at least for the moment. We went to the vet today. Everyone there was totally fawning over him, saying they had never seen such a beautiful kitty. Indeed, Noah thinks this is true. He was deemed to be VERY healthy and has already gained 6 ounces. I don't think there are any adjustment problems here. Thank you again. You have prepared them well. Oh, BTW, he loves to watch TV. He lays in front of the set, back legs splayed out to the sides, head resting on his front paws and WATCHES the TV - it is totally hysterical. Will need to get a photo of that!" August 14, 2014, via email: "Hi Susan, I have been very busy so I am finally writing to let you know about our significant progress with Noah & Cleo. As I previously told you, we were gradually - 15 minute intervals - introducing them to each other. At first, Cleo would just run away as Noah would run towards her. Then we went through the "hissing" phase - not an aggressive hiss, just a "this is my territory and you are intruding" hiss. This caused Noah to back off a bit and, guess what - Cleo got curious! We spent several evenings with no negative interactions, although I was still putting Noah in the sewing room when I left the house and overnight. Then, alas, Cleo started coming into Noah's room. Then, 2 days ago, I decided to let Noah free for the night. We woke up in the middle of the night with Noah sleeping between us and Cleo at the foot of the bed. SUCCESS!!! I have left them alone together for the past 2 days when I went to the studio. They are not yet "best buddies" but they are getting along well and even playing together a bit. Noah is doing great. He seems to grow visibly each day. He is a real sweetheart. As I said to Michael, I am totally in love! I have one more story to share with you which will explain the enclosed photo. Many years ago, I would bring home platters (made by me and fired once - i.e., not yet glazed) to paint and decorate. Latte was quite fond of these platters, mostly because they were rough and he would roll around and scratch his whiskers, etc. So, I finally decided to give Latte his own plate. Latte's plate lived on the kitchen table and Latte spent many hours in that plate each day. After Latte passed, the plate moved into a corner of the kitchen and was filled with magazines. Well, a few days ago, Noah went to the plate and started scratching at it. Since he was always trying to jump on the kitchen table during dinner, I found the plate and put it on the corner of the table. WELL, Noah loves Latte's plate! It is one of his favorite places to snooze during the day. During dinner, he sits in the plate and watches us without trying to climb into our dinner plates. He is such a smart boy! Mike thinks the plate is magic. I think it has Latte's spirit." September 19, 2014, via email: "Noah is doing great. He is huge. He is really growing into his personality -very sweet - although right now he has moments of wild and crazy adolescence!! He and Cleo are getting on well, altho sometimes he is a bit too crazy for her - chasing her all over the house. We (Mike & I) are both crazy about him." October 13, 2014, via Facebook: "Noah has grown out of his plate! Our baby Noah - born to Diamond and Willy on April 30th is HUGE. He weighed 7lbs, 9 oz at the vet last week. He loves to sleep in this plate, but I don't think he will fit for very much longer. Vet thinks he will be a 12 lb cat. Wow!" "Yes, he loves his plate - which is a BIG plate! He is so sweet - very chill personality. Loves to be brushed! Loves kisses! Still nursing!!" October 21, 2014, via email: "Hi Susan! I am happy to report that Noah went for his neuter today and all went well. All the vet techs adore him so he is treated royally!! He is now resting comfortably and should be bouncing around by tomorrow. He is growing like a weed and is very healthy! Unfortunately, he is still nursing - voraciously - even though I have bought all kinds of soft toys and even a big stuffed bear that is dressed in one of my T-shirts. I think it is a bit better. Every time he starts, I put him on the floor. Used to have to do that about 20 times per night, now only 3-4 times. I am hoping the neuter will help. Don't know why I think this. Maybe just wishful thinking!" October 24, 2014, via email: "Hi Susan, Noah is doing great after surgery. You would hardly know he had anything done! I am quite relieved to have had this done. He is my baby and I worry about everything!He is QUITE the lap cat - spends his evenings sitting in my lap watching TV. I guess my knitting days are over!" November 20,2014, via email: " Found Noah playing with cup in sink. He was having a ball! Always in trouble! LOL....."
December 4, 2014, via email: "Well, I stopped by the vet's office yesterday - just to visit (they all love Noah!) and to have Noah weighed. Wow! He is 9 lbs, 8 oz and very handsome. Thought you might be interested." " It is all muscle - no fat (yes, he is eating Young Again). In fact, it was early October that he was last weighed and he was 7 lb, 8 oz. I thought he had gotten big which is why I was curious to have him weighed again. He has mellowed out post-neuter. It just took some time. For example, he is still sleeping in the sewing room. I always feel bad putting him in there at night but he doesn't seem to mind at all. This is what is normal for him. I always think of your arrangement where cats all sleep in different rooms- it is just what they learn is normal for them. Of course, he is delighted when Mike lets him out in the morning. He runs upstairs and jumps on me. He kneads & nurses for a few minutes and then cuddles up and goes to sleep. He loves to sit on my lap and snooze - such a lap kitty!" January 8, 2014, via email: "Bella is the spitting image of Noah- will have to send you a photo. I noticed that Bella was rewarded with whipped cream. Noah LOVES ice cream! Every night my husband says, " Noah, do you want some ice cream?". Noah runs into the kitchen, jumps on the table and starts yelling for his teaspoon of ice cream - a lot like his sister(??). Genetics is a powerful thing!" February 8, 2014, via email: "Noah is doing great. As I told you, he is now free to roam at night. I brought his quilt from the sewing room up to my bedroom and put it on the floor next to my bed. He spends most of the night sleeping there. Mike tells me that Noah jumps on me in the morning, nurses awhile and then falls asleep. Fortunately, I sleep through it all. We seemed to have reached an equilibrium." February 21, 2014, via email: "Hi Susan, I had to send you this photo of Noah! He got really knotted and we had to give him a lion cut. His hair was so full of static that I would comb him out one day and by the next morning, he was matted. Rather than torment him, I took him to the vet for a clip and shampoo. He has that real cotton candy fur so I am going to have to start bathing him weekly. Fortunately, he doesn't seem to mind. He looks so cute - all muscles - and he is so happy. He loves to be rubbed. It is surprising how white his undercoat is. He is doing great. He spends most of his life sitting in my lap - just like his sister, he is such a lap cat!! Mike thinks he is so adorable with his lion cut. He is so spoiled . Every night around 9 pm, he goes over to Mike and starts screaming for his ice cream. Never any other time - only at 9:00! Of course , he gets his ice cream - every night!! This pic is almost 2 weeks old. He is already growing out and looking black again. Will have to send another photo soon." February 28, 2014, via email: "Hi Susan! Just couldn't resist snapping this photo of resting kitties! So, my friend stayed at my house the past few days b/c she had no power at her house. She so fell in LOVE with Noah (& she says she is not a cat person!). She said he is a "dog" cat - followed her around, cuddled and played. He is such an attention monger. It was fun to watch!" March 1, 2014, via email: "Hi Susan. I am so proud of myself! (You probably think that is a bit silly!). I gave Noah a bath this morning. My previous experience giving cats baths has not generally been good but he was a darling!! I watched this great video on YouTube and had 2 sinks ready for him / one with soap and one for rinsing. They suggested you start by getting his tail wet and then I slowly got the rest of him in the water. The rest (rinsing, drying, blow drying) went so well. He was so good! Thank you for bringing him up so well. Now that he has had a lion cut, I thought I would get him in the habit of baths and I am not afraid anymore. Now he is so nice and soft ! Just had to share with you!! Yeah!"